The salt marshes in the southern part of Denmark has a richer flora with several warm demanding species. The hairy Bassia hirsuta in the right picture has most of its few danish populations on the South Eastern Isles. It grows on rotting eelgrass and algae along the coasts. It can suddenly geminate in large numbers under the right conditions and soon after disappear. Teucrium scordium in the left picture is only found at the south east in Denmark. 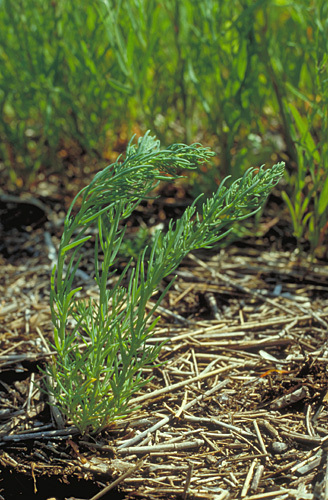 This species can be found in fens and marshes with a low salt concentration. Other species with most of their populations on The south Eastern Isles are Pulicaria dysenterica, Inula britannica, Ranunculus polyanthemos, Ranunculus sardous, Ononis spinosa ssp. 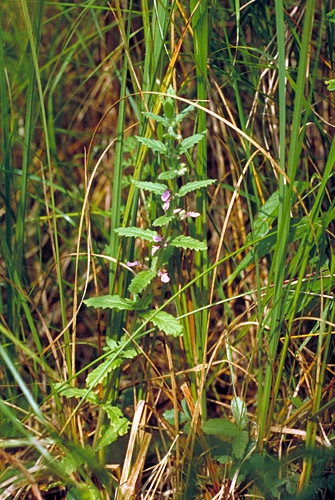 spinosa, Melilotus dentata, Carex extensa, Chenopodium botryodes, Lotus tenuis, Althea officinalis, Juncus maritimus and Hordeum secalinum. Species as Ranunculus sardous, Ononis spinosa ssp. spinosa and Melilotus dentata can some places be seen as quite common along roadsides due to salting in the winter. Back to The South Eastern Isles.